Amy Jackson is an @ Homes Realty Group client who has attended our Great Pumpkin Festival in the past and has written about her experience for us in preparation for Saturday’s event. We love Amy and her family and are so appreciative of all of the wonderful things she had to say about the event and about working with @ Homes. @ Homes Realty Group isn’t just a real estate company concerned with the buying and selling of homes, they’re a company with a big heart concerned about their clients, and once a year they put on an event to show their appreciation. Every fall @ Homes hosts The Great Pumpkin Festival for their clients as a way to say thank you, and every year my entire family looks forward to this fun annual tradition. This year the @ Homes Great Pumpkin Festival took place at Lyon Family Farms. They have hay rides out to the pumpkin patch to pick your own pumpkin and a petting zoo with lots of fun animals. The kids loved the giant pillow bounce, and even our teenager enjoyed the challenge of the corn maze, but the zip lines were a favorite with the entire family! @ Homes provided hotdogs, drinks, and popcorn, but if you’re visiting Lyon Family Farms during regular business hours, The Dinner Bell has a great selection of food – everything from burgers and hotdogs to funnel cakes and fried Oreos. 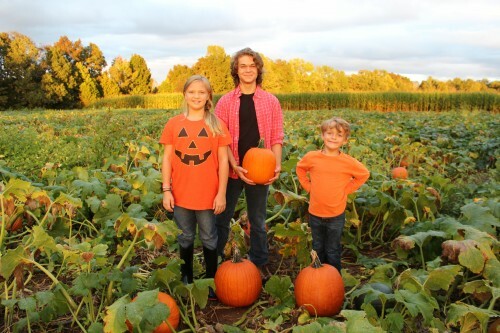 If you have the opportunity between now and October 31st, I highly recommend Lyon Family Farms as a great place for the entire family to make fun, fall memories. Even more though, I recommend @ Homes Realty Group for all your real estate needs. They don’t just build business, they build relationships. In fact, for Elizabeth Golden, the owner and lead broker, 95% of her clients are repeat or referred. My husband and I first met Elizabeth seven years ago when we were relocating from central Florida. It was clear from the beginning that she was more than just your average real estate agent, and she made our transition to a place we knew nothing about so much easier. She had a vision to found a brokerage that mattered to the consumer, the agents, and the community, and four years later we were happy to enlist Elizabeth and @ Homes Realty Group to help us with our next move. You can feel confident that with @ Homes Realty Group you’re going to be taken care of, you’re going to have all the support you need during such an important time in your life. You will also become part of the @ Homes family where that relationship continues even after your home is bought or sold. I hope we’ll be seeing you at the 2016 Great Pumpkin Festival.